YF1AR yankee foxtrot one alpha romeo: Sunspot Roller Coaster; Will ARRL DX CW Be Wide Open or Repeat of Quieter Times on the High Bands? Sunspot Roller Coaster; Will ARRL DX CW Be Wide Open or Repeat of Quieter Times on the High Bands? How times have changed. Just two years ago, the dominant narrative in the ham radio contest community was the terrible condition of the high bands in HF contests and the lack of sunspots. Now after a big surge in sunspots, some wonder if we're headed back down. If the sun can perk back up, the ARRL DX CW Contest may bring a focus again on new records, as we saw last year. 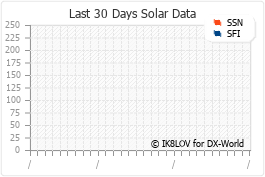 In 2011, sunspot numbers were just coming up from a lengthy hiatus, as Valery Komarov RD3A set a new DX record from PJ4A of almost 7.5 million points. New Single Operator High Power records were also set for North America - ZF2AM/K6AM at 6.59 million points - and for Europe as OK1RF ran CS2C to 4.09 million. In the US and Canada, there were also some new entries made in the record book as Jeff Briggs K1ZM set a new Canadian record of 5.9 million points from his VY2ZM super station. The overall W/VE record still stands at 6.58 million by Scott Robbins W4PA, who tapped that out in 2004 from the home station of Randy Thompson K5ZD. As always, you don't have to be a major player to find a record that might be attainable in a major contest like ARRL DX. You can look at that list two ways - they are old records and are ripe for the taking this year - or they were so good, they have stood the test of time. The W/VE records are available in a pdf file on the ARRL web site. One category where records may certainly change this year is in the Single Op Low Power Assisted category - which just started in 2011, along with the Multi-Single Low Power category. M-S LP didn't even have any entries from W2, W5, W6 or W8 - which might provide some group an opening in 2012 for a spot in the ARRL DX CW record book. As for the Multi-Op side, the record for the US and Canada in Multi-Two has stood since 2001 for Team K1AR (at K1EA), while the Multi-Multi record hasn't budged since 2002, when Team KC1XX hit 17.5 million points. In 2011, K3LR took the Multi-Multi honors with 14.3 million; KC1XX won in Multi-Two with 12.1 million, both well off the all-time records. On the DX side, the same openings exist, especially when you look at the single band marks on 10 meters, which have been much the same for years. The overall record on 10 meters single band was set back in 1993 at ZD8LII (G0LII); the 10 meter records from Asia and Oceania haven't moved since 1989 and since 1990 for North America. A look at the 15 meter records shows what can happen when sunspots return, as new marks were set in Europe, North America, Oceania and South America in 2011 - but - the overall record by XT2WP from 2003 still stands. Myabe that will change this year. Single band records for DX stations on 20 and 40 meters were both set in 2011 as well. One cautionary note is that the sun has quieted down a bit since a very active October, November and December - the sunspot number at this writing was just 51. "Well, we've regressed to the same point as we were a year ago with pretty much nothing indicating a rebound," wrote Mike N1TA on the CQ-Contest reflector, as contesters have started to worry about which direction the sun is going. "I still have seen propagation on 10m and 15m to EU but short openings and very limited in scope," wrote Rick Daugherty NQ4I in recent days. Will things perk up for ARRL DX CW? Or are we heading back into some lackluster propagation on the bands? "There is only a light hope the things will improve before the ARRL DX CW but STEREO images shows nothing spectacular in upcoming days," cautioned Remi LY80. "Lets keep our fingers crossed." And so, we wait for the 2012 version of the ARRL DX Contest. The ARRL DX CW Contest begins at 0000z February 18 and ends at 2400z on February 19.